PM me for other Transducer options. GPSMAP 1242xsv Touch is the ideal choice for the coastal fisherman who wants to step up to a big, bright 12" touchscreen combo. It includes built-in 1 kW single-channel CHIRP plus ClearVü and SideVü scanning sonars, and it’s compatible with Panoptix all-seeing sonar. Preloaded BlueChart g2 HD charts and LakeVü HD maps provide market-leading features such as Depth Range Shading and Shallow Water Shading. It features full networking capabilities to build your marine system with radar, autopilot, sonar modules and sensors. It also supports FLIR cameras, GRID™ keypad, GXM™ 53 marine weather receiver, FUSION-Link™ audio system, VIRB® camera streaming and more. Network sharing allows you to share data among all compatible units connected to the network. Plus, it has built-in Wi-Fi® to support the ActiveCaptain™ app. LakeVü HD provides highly detailed freshwater maps that include 17,000+ U.S. lakes, rivers and reservoirs. Included in those are more than 13,000 HD lakes with up to 1’ contours. Upgrade to LakeVü HD Ultra with Max Def Lakes to access the Auto Guidance feature, sonar imagery and more. BlueChart g2 covers the East Coast, West Coast, Gulf of Mexico, U.S. and the Canadian side of the Great Lakes. It includes basic coastal charts, tidal and current stations, depth contours, IALA nav symbols and fishing charts. Upgrade to BlueChart® g2 Vision® HD to access Auto Guidance and more. Last edited by semperfifishing; 09-30-2018 at 11:07 AM. I am contemplating purchasing tis unit ofr a modified Hull boat. Will be primary fishing in areas no more than 150 feet. Most of the time around 40 to 60 feet. Looking for a Transducer that will work very good for traditional sonar as well as downscan and especially sidescan. So no need for a thru hull? Will I still get good chrip quality sonar, downscan.? the GT52Hw is CHIRP Traditional, CHIRP side and CHIRP down. just like the screen shots I posted. Would it be possible for you to make a brief rundown of the difference between the 1242XSV touch and the 7612XSV ? Was salivating over the 7612XSV but am curious why this one is cheaper. It can fire two different ducers at the same time..or fire a single dual band ducer. The 1242xsv has 1 transducer port. It can fire only 1 ducer . And it has to be a single band..or a Side and Down scan etc. We ship both....but for those only need 1 ducer..you save a ton of $ on the 1242 xsv touch..or not touch..over the 7612xsv. 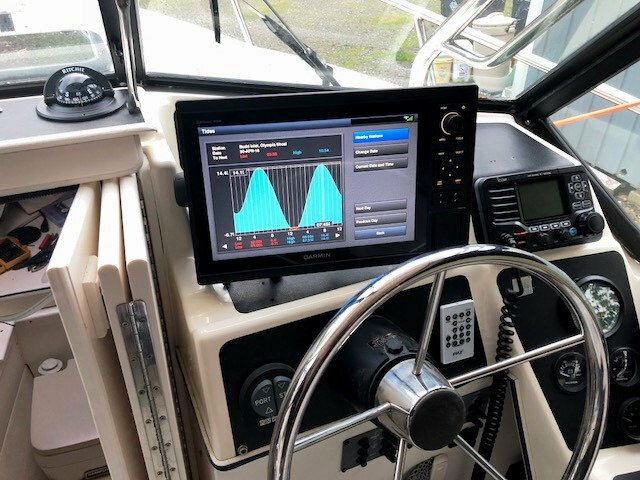 The Garmin site shows that this new touch chart plotter is compatible with the new GCV 20 Ultra HD sonar system. If you install that system are you still only able to use one transducer, the transom mount that is designed for the GCV unit? If so, would you be giving up the higher running speed Performance of a thru-hull transducer? Would you also sacrifice performance beyond a certain depth? That still allows one to use the normal transducer port....you then have a very wide selection of traditional transducer options. and also use the side and down scan of the GCV 20 at the same time. Gil, boat and repair and taxes are done..... Getting ready to order, when is your 'quiet time' when you'd rather not get calls? Do you handle VHF antennae or have a source for a good 8' Digital? Call anytime..working 7 days a week now... phew! Thanks Gil. I ordered the Garmin 1242 xsv last Monday along with the Arirmar T 185 M 1 KW transducer. The Garmin arrived last Friday and the trransuder today ( Monday ). Very impressive delivery time and free to me also. I'll report on the transducer when I get it mounted and wet. hey Gil, Can you connect an underwater camera to this screen? What makes the garmin gpsmap the higher end unit compared to the new garmin echomap ultra series in a comparable screen? I notice the ultra can run the UHD without a black box. Also, both have two garmin marine network connections. screen resolution looks the same. what sets the gpsmap series apart? Is there difference in hardware? I will not be connecting radar or anything as I fish 100% inland lakes. Networking units is a selling point, but its not that huge for me. I know i can use helm with the gpsmap series, but that would only be beneficial to me if I could run two separate views at the same time, not just mirroring. Trying to decide on a 1242xvs or whatever the new echomap ultra is that is a 12" that runs sonar. I think only the 8XXX series can run the UHD without a black box..I would assume that means hardware changes to make it run without a black box. For 100 % lakes..the new ultra is the ticket. The Garmin Ultra is designed for use of the full line of Panoptix system....no black boxes required. Ultra High Def built in. Built in Wifi allows use of ActiveCaptain. Networkable to other 10"/12" Ultra units or to the Garmin 94sv/74sv Plus units. A GPSMAP such as the 8610xsv...also has the Live Scope built in but also is radar capable, and also can fire a single or dual band 1 kw CHRP transducers. and is full networkable to other GPSMAP units. Last edited by semperfifishing; 04-14-2019 at 08:44 AM. I have a thru hull transducer in my boat, can I just plug that in to this unit and rock on? I understand that I will not have the advanced capabilities, but would be nice to just mount this unit and go, save any big work for the fall.